How can I improve my Temperature and Shade Control with Awnings? Retractable awnings. What are retractable awnings good for? The answer is plenty. As a homeowner you can use manual and motorized awnings to not only beautify your patio or deck, but also provide you plenty of shade. There are so many awning design options available. If you cannot find what you are looking for in awnings, you can request that professional awning company, like Carroll Awning Company, design custom awnings for your residential property. Residential awnings are the ultimate homeowner solution for sun blocking, shading and temperature control for outdoors spaces. If you need to improve the waterproof of your outdoors, you can have waterproof vinyl or marine weave acrylic fabrics used for your awning designs. Awnings are designed in a way that makes it easy for homeowners to control the amount of light and shade they receive on their patios, decks or other outdoors spaces. When shopping for retractable awnings or other residential awnings, you should always do business with an awning company that’s reputable for producing high quality awnings. Awnings can be installed as window awnings, door awnings, and other stationary and retractable awning solutions. When you need clem, mildew free, low maintenance awnings, you can count on Carroll Awning Company to meet your needs and exceed your expectations. 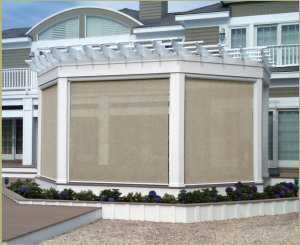 At Carroll Awning Company, we want to improve your home property attractiveness while giving you utmost control over your outdoors thermal settings. We want to protect your patio furniture and home interior from UV damage. We want to shield you from the powering rain. We want to enrich your life.